McNab, who served in the SAS before turning bestselling author with Bravo Two Zero, was responding to a new study for the Reading Agency conducted by by OnePoll, which found that 63% of men admit they don’t read as much as they think they should. Almost 30% of men went so far as to admit to researchers that they hadn’t really picked up a book since they were forced to read at school. Not to take anything away from the point, but I remember from my time as a bookseller over a decade ago that the lack of male readers was a big concern even then. I’m not sure anything has changed, or that things are even worse. I mean, could consider myself one of the 63% that wished they could read more – my reading pile is getting obscene. In response to this, the Telegraph publishes 10 books to get men reading. A curious collection, at best. As a former bookseller, I’d shove them into the crime and thriller section as a good place to start – largely because many of those books are designed specifically to engage and keep the pages turning. That’s ideal for people who don’t read much. Speaking of which, world’s best-selling author James Patterson spills the beans on how to write an unputdownable story. Finally, Juliet McKenna has some thoughtful things to say over at the Guardian about the literary potential of Science Fiction and Fantasy. In a fight against illiteracy among the young, heavyweight boxer Wladimir Klitschko becomes an artist and typographer. You can even download the font he creates in the video. 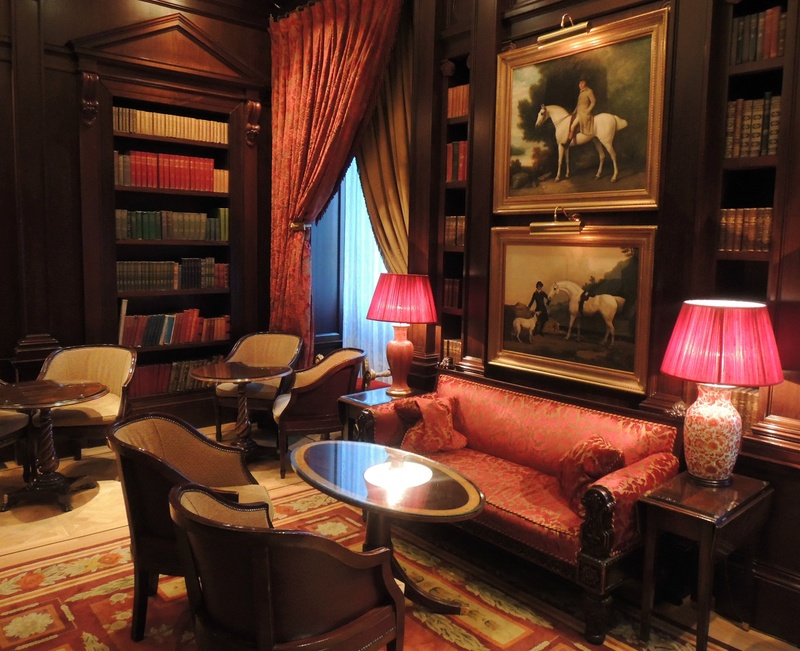 This is the Library Bar at the Lanesborough Hotel. Let me just run those two words by you again. Library. Bar. Could there be a more perfect place? (No reason for this post, just gratuitous library p0rn.) Photo source. I’ve just started using Writer Pro for the very first time. I’ve been using various bits of writing software over the years, namely Scrivener, but Writer Pro offers something more useful: minimalism, the ability to focus on one sentence at a time by fading the rest away, and highlighting the frequency of adjectives, adverbs and so on. There are few features to speak about – it deliberately prevents you from being able to play with the font size, formatting and whatnot, which is actually pretty cool. It means you just write, and make sure the sentence you’re writing is as good as can be. First impressions are – yeah, a few glitches aside, this could be the most useful thing I’ve discovered in a long time. It’s not one for complex planning tabs, and having lots of notes around your work, but that doesn’t mean you can’t have those open on other bits of kit in the background. I like it a lot so far. There are less than a handful of good secondhand bookshops in Nottingham. 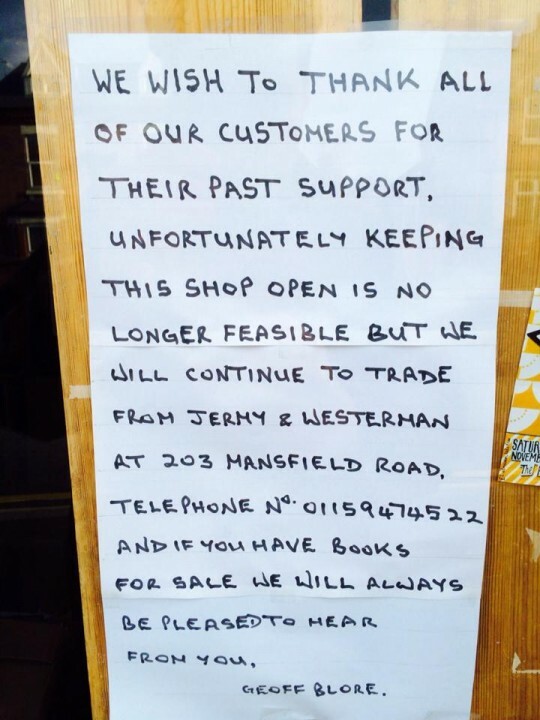 But there was one – Geoff Blore’s Bookshop – that I used to frequent every couple of months. If you got there on a Saturday, you’d probably end up being served by a man who gave you plenty of discount for no apparent reason. Being a bibliophile, you’d then immediately head off to pile on more books. I think his name was John, and he greeted you with a “Hello, Friend” no matter who you were. Geoff Blore’s was, I think, co-owned by another secondhand bookshop, further into the city centre, but this one was far superior. It had a much better range of books, and it was much more neatly organised than the other. In fact, it was one of the best secondhand bookshops I’ve been in (and that includes a trip to Hay-on-Wye), beaten only by Scarthin Books because that place serves cake and has a cat. Anyway, Geoff Blore’s has now closed, and when I arrived today I was greeted by that depressing sign. I wasn’t really going anywhere with this; I understand market forces, signs of the times and whatnot. I merely wanted to vent my annoyance. 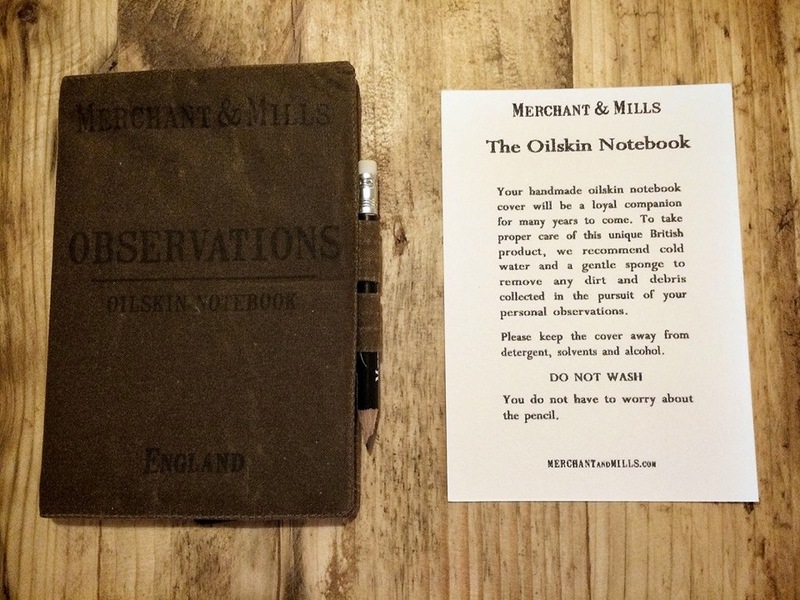 So I’ve gone back to physical notebooks. There’s something to be said about bunging emails back and forth as notes, or thumbing something into your iPhone as record, or even moving things about on Scrivener, but actually, to physically write down ideas in a notebook is something I haven’t done for a while. It’s a step back to how I used to do things. We’ll see how that goes. Anyway, it’s a lovely notebook. it is at once squalid & unattractive. to disembarrass himself of your talents. as Fabullus mine – must always be. From this translation of Catullus‘ poems.